Ooooo spooky. And cute too. Have a happy Halloween and a wonderful trick or treat. Love your Spooky pic. Yikes, at furst, you scared me!! Teehee!! Happy Howl-a-Weenie!! Spooky pup! 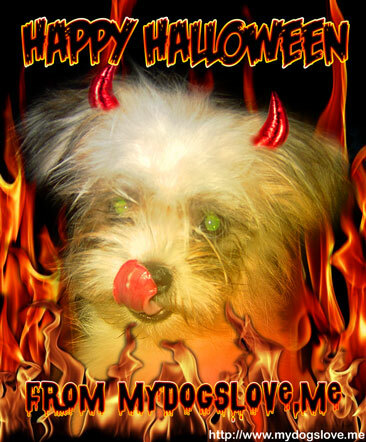 Wagging Wordless Wednesday Halloween! HAP-PEE HOWL-O-WEENIE FROM DaWEENIES AND OUR PACK! What a little devil! Happy Halloween! Aww, is it possible to find a sweet devil? Yep, right here. What a spooky little devil. Happy Howl-o-ween! You make a scary devil!!!! Happy Halloween! You're lookin' HOT! Great picture. Our Halloween is over. BUT, we cleaned up a few dropped 'treats' on our early morning walk. Now it's time for our first November nap. That is so scary! Very cool!